The stock market has had a good run lately, but all good things come to an end eventually. And many of us remember a time not too long ago when a big crash wiped out billions of dollars in investment gains. Fear of a downturn, however, should not be an excuse to get too conservative in your investment approach. While it may be tempting to avoid stocks and keep all your money in cash and bonds, there is a real risk that you may find yourself without enough saved for retirement. While many of us may view stocks as “risky” investments, the more risky move is to play it too safe. Here’s why. It was once common for someone to work into their 60s and pass away in their 70s. It wasn’t necessary to prepare for a retirement of more than 15 years or so. But now, there are many cases of people living into their 90s and beyond. In fact, it’s not unheard of to have a retirement that lasts longer than your work life. Are you on track to save enough to last 30 or 40 years? 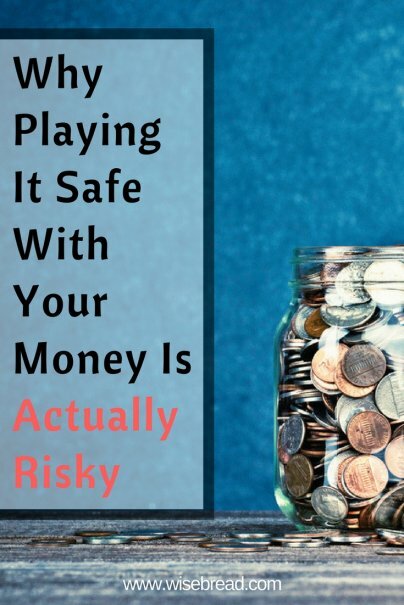 You may be tempted to put money in a savings account or in certificates of deposit due to their safety. But bank interest rates and bond yields are still very low by historical standards. Consider that you’ll be lucky to get a 1.5 percent annual yield from a savings account, while bond yields are between 1 and 3 percent. With rates this low, your money may barely grow faster than the rate of inflation if you don’t invest in something more aggressive. It’s fine to keep a sizable fund in cash in the event of an emergency, but keeping the bulk of your retirement fund in low-interest accounts is not the ticket to a comfortable retirement. You may envision your retirement as a time spent traveling with your spouse, lounging on beaches, and doing crossword puzzles. In truth, it may be all that, plus a hefty dose of financial and child care support for your kids. A survey from TD Ameritrade revealed that millennial parents receive an average $11,000 annually from their own parents in the form of financial assistance or free child care. While these older citizens are eager to help their kids, 47 percent of them do admit that they have to make sacrifices in their own life to offer this assistance. You may be banking on Social Security and other government programs to help support you when you get older. We all hope they’ll be in place when we retire, but the stability and future of those benefits is subject to the whims of our lawmakers. Social Security and Medicare both are facing long-term budget shortfalls, and many lawmakers have advocated for adjustments to benefits in order to ensure these programs remain solvent.